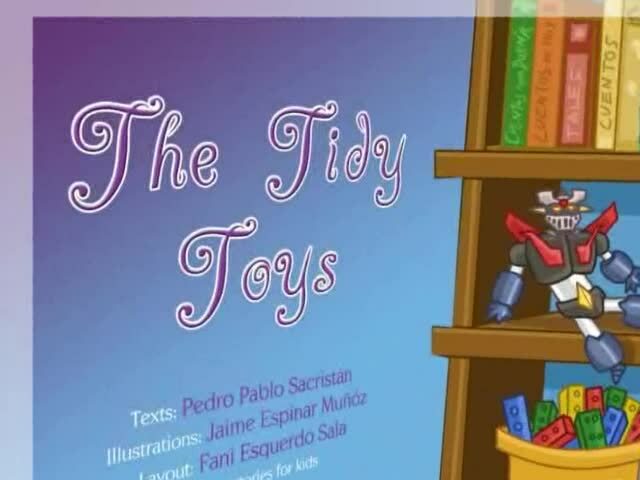 The Tidy Toys. Animated story narrated in British English. Once upon a time, a boy moved houses. On entering his new bedroom he saw that it was full of toys, storybooks, pens, pencils... and all of it was perfectly tidy. That day he played all he liked, but went to bed without having tidied up. Mysteriously, the next morning all the toys had been put back in their proper place. He was sure that no one had entered his bedroom, but the boy didn't pay it much mind. The exact same thing happened that day, and the next, but when the fourth day arrived and he went to get his first toy of the day, the toy jumped out of his hands and said, "I don't want to play with you!" The boy thought he was seeing things, but the same happened with every toy he touched. Finally, an old teddy bear said to him: "Why are you surprised that we don't want to play with you? You always leave us so far from our proper place, the place we feel most comfortable and happy. Do you have any idea how difficult it is for the books to climb back up onto their shelves, or for the pens to jump into their tin? You haven't a clue how uncomfortable and cold the floor is! We won't play with you any more until you promise to leave us in our little houses before you go off to bed." The boy remembered how comfy and content he felt in his bed, and how bad he felt when he had once slept in a chair. He realised how badly he had treated his friends, the toys. He asked their forgiveness, and from that day he always put his toys nicely in their special places before he got into bed.